All SQL queries in this article listed here. No repeating value and no repeating group, for example, consider a product table contains [productID, productColor, productPrice]. In this case, if we have a record that store two colors at the same time in the productColor such as “red, green”. It breaks the first normalization rule, and to make it normalized, we need to create a separate table for color. In the end, we have color table contains [productID, productColor] and product table contains [productID, productPrice]. It must be 1st normalization form, and besides, all non-key attributes must fully depend on the key attribute. For instance, we have a purchase table contains [customerID, storeID, storeLocation], with the primary key (combination primary key) of [customerID, storeID]. In this case, storeLocation depends on storeID, this break 2nd normalization form. Consider somebody change a storeID to something else, and he does not change the storeLocation, this brings inconsistency in data. To make it 2nd Normalization form. We make a new table for location. Then, we have purchase table contains [customerID, storeID] and location table contains [storeID, storeLocation]. In this case, if somebody changes storeID, it does cause inconsistency in our data. It must be 2nd normalization form, and also, all non-key attributes must not have any dependency on any other non-key attributes. Technically, this is 2nd normalization form that apply to the non-key attributes. For example, we have an order table contains [ID, productID, quantity, unitPrice, totalPrice], in this case, the totalPrice that results from quantity multiples unitPrice does not follow this rule. We could remove totalPrice from the table and calculate it on the run-time, such as a writing Store Procedure for it. In another example, we have competition table contains [ID, name, year, winnerName, winnerBirthDay]. You could see that winnerName and winnerBirthday are depends on each other. To resolve it, we create a new table called it winner contains [ID, name, birthday] and change the competition table to contain [ID, name, year, winnerID]. Indeed, there are a lot of time that performance concerns, normalization might degrade the performance or bring complexity in the development of an application. For example, employee table contains [name, address, phone1, phone2], this is not 1st normalization form, but we see, there are a lot of tables such as this in real world application. Another example, address table contains [ID, address, city, province, postalcode], this is not 3rd normalization form, as by having a postal code you could extract city and province. Though, it could be 3rd normalization form if there are a postalcode with two different provinces and two difference cities. List all the students who their last name are James. List all the students who their last name start with James. Character % means whatever that might come after without any length limitation, while, character _ instead means only a character. Additionally, like is a very inefficient command in the database. List all the students who marks are from 60 to 90. List all the students that their last names are not entered. List all the students, order them by their first names, and if first names are identical, then order them by last names. count(ID), sum(price), max(price), min(price), avg(price) are some of aggregation functions in the SQL. List the total price of all products under category with ID 241. List the average price of all products under category with ID 241. The aggregation function only returns one single value, if you want to combine aggregation with other fields to return multiple values, you need to use group by. List the average price of each category. List the average price of each category that the average price is higher than 100. There are different kinds of joins in SQL, by default join is set to be inner join by most DataBase Management System (DBMS). An inner join only returns the records that found a match both of the tables involving in the inner join. As an illustration, if we have a person and contact tables, and there is a person that does not have a record in contact table, the inner join would not return that person. 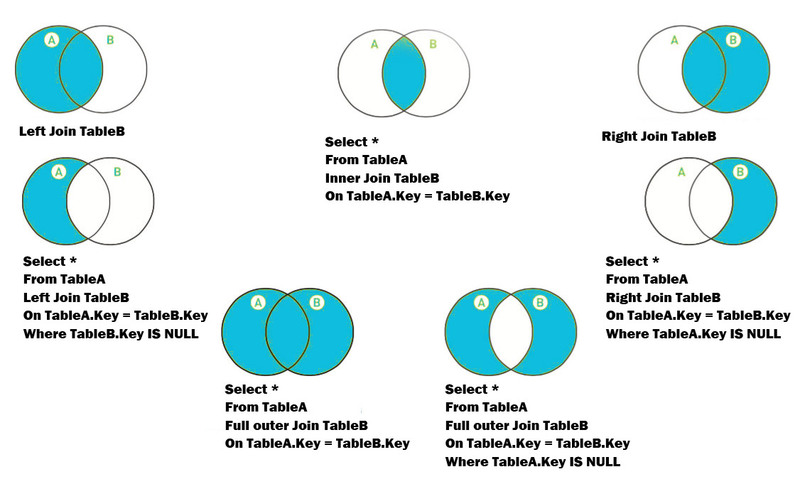 The following figure illustrates all kinds of joins that could happen when joining two tables over each other. Add relation between the student and take. In this situation, we need to set the foreign key in the take table. Take table is between course and student table, it list studentID and courseID. Each student can take multiple courses. Set character set to utf8, collation to utf8_unicode_ci, and Engine to InnoDB of a table after you created the table. There has been a time you faced with a large table, in this case, only executing a select query; it might take 20sec. Then, indexing plays a critical role for you. However, you must consider indexing in the early stage of your database design. The concept is very simple; I remember my first programming language book that was around 1100 pages (It was C Programming Language ). There are a lot of indexing in each book, for example, there is keyword indexing at the end of a programming language book that tell you which page has mentioned a particular keyword such as class. There are two kinds of indexing that you could define on a table. They are clustered and non-clustered indexing. You can only have one clustered indexing in a table while you can have multiple non-clustered indexing on a table. By default, DBMS set the primary key to be the clustered. For instance, InnoDB Storage Engine considers the primary key of each table as clustered index in MySQL. In most of DBMS, you have the option to explicitly specify a different field of your table to be the clustered indexing. Clustered indexing means how physically your data are stored in your table. Going back to the concept of a book to explain clustered and non-clustered indexing. The clustered index is the Page Number in a book, as the physical order or a book is the page number. Non-clustered indexing is a list of figures, chapters, or keywords at the end of the book. In an illustration, consider student table at a university with more than 1,000,000 records, as the university has operated since 1970. For simplicity, we use the student table that is defined in DDL. On this way, if we list all the students with a specific last name on the where condition, the students list instantly appear to us. There are pros and cons to consider a field for indexing. It is true that make the execution of select(Data Retrieval) statement very fast, while when we make an insert into the table, it takes longer time. As the DBMS needs to create indexing for this new record. We have a chunk of SQL queries that we call them frequently. We do not want to spend a lot of time each time to rewrite them again, we store them in a place and give it a name. Then quickly call it by the name, and it does the job for us. Store procedure in SQL plays the same role as Function or Method in programming languages such as C++, Java, etc. Additionally, Store Procedure is very handily most of the SQL statement that we have seen until now in this article were simple, while, in real worlds, you need to deal with much more complex SQL queries. Create a Store Procedure to list the average price of each category in the product. Example from the 3rd form of normalization in this article. Create a Store Procedure to list the total price as well as other attributes in the order table [ID, productID, quantity, unitPrice]. Create a Store Procedure to list the students, their course, and the taken semester who got mark less than giveX for a particular course name. Note: the syntax of store procedure in different DBMS might be slightly different. There are times that you need multiple nested queries to get the list that you want. List all employees who their salaries are bigger than the Jack’s salary. Note: the field in the second select statement is the important part. It must exactly match with the same field in the where statement of the first select statement. Besides, in this example, I consider there is only one employee with the name of Jack in the company. Otherwise, we need to use All in the where statement of the first select statement. I illustrated All in the following example. List all of the employees who their salaries are bigger than the salary of Jack, Steven, and Alex. To simplify it, if we know the salary of each of them, we can write it as below. Increase the salaries of all of the employees by 20% who have worked in the company since 2012. In this case, we need to break the question into smaller chunks, so list all the employees who have worked in the company since 2012. It is a simple select query as below. Copy all of the records from the employee to employee_backup table. We have an employee table, and we create a new empty, identical table called employee_backup( with same structure). Note: since employee and emloyee_backup have exactly identical structure, we no need to list the attribute name and their order in the insert statement and respectively in the select statement. The difference between Any(Some) and All in the nested query illustrated by example as below. While for any instead of and we use or, as below.